When is it too Late to Plant Trees in Fall? As the cold weather sets in, fall is planting time for many tree species. 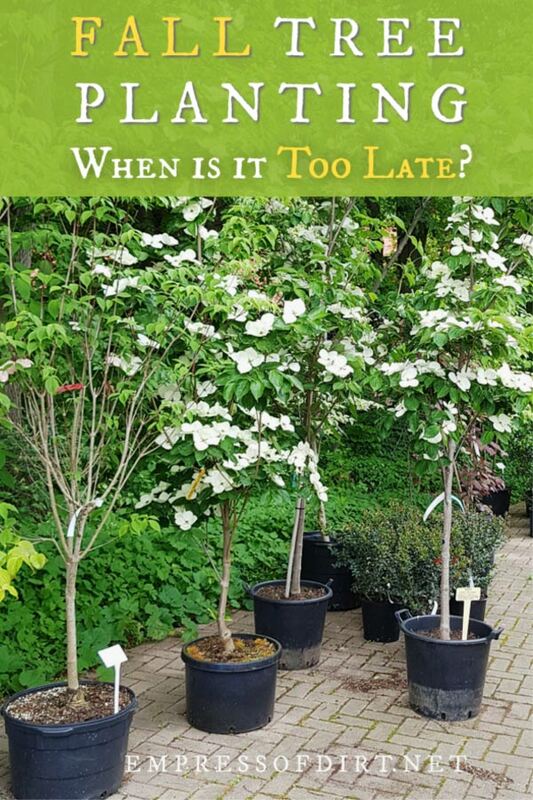 Let’s look at the best time to get trees in the ground, when it’s too late in the season, and the right way to plant a tree. If you’re planting bulbs, here’s a list of 20 Flowering Bulbs to Plant in Fall. NEW! Click play to hear When is it Too Late to Plant Trees? The right time to plant trees depends on where you live and what you’re planting. For cold climate gardeners in North America, August through October is the general fall tree planting time range. Most trees can be planted at this time with some exceptions that do better in spring including magnolias and willows. Evergreens require the most time to get established, followed by deciduous trees which do best for new root growth in soil temperatures around 50°F or 10°C. If you live in Florida, you can probably plant trees any time you want. It’s a different story if you’re in a cold climate where the ground freezes. The catch is, we can’t always buy the trees we want at optimum planting time. Where we live, the garden nurseries have a wide selection in spring, and by fall there are few options left. That pretty much dictates our planting times. The good news is, spring planting can work fine too so long as all the basics are covered: right tree in the right site, and adequate water. Frost Dates Calculator | This calculator at Almanac.com is simple to use. Enter your city and state or province to find your first and last frost dates and number of frost-free days. If I had a potted tree and winter is approaching, I’d get that tree in the ground even if time is short, knowing it’s going to do better in the ground than it will in the container. Come spring, be sure it’s getting the water it needs. If it’s really too late to plant, you can overwinter a potted tree the way I do my fig trees and then get it in the ground in spring. Tree roots grow well in soil temperatures around 50°F or 10°C. Once you’re down to 40°F or 5°C, it gets harder on the roots. For us here in southwestern Ontario (zone 6b), the fall temperatures are wide-ranging and unpredictable, but to be safe, our cut-off time is late September. When it’s colder, there’s also going to be less time for you to water the trees, which they need after being planted. Once you have freezing temperatures, it’s too late for watering. One of the advantages of fall planting—for deciduous trees, at least—is that they can put their energy into establishing roots instead of growing leaves. And that requires less water, but they do still need to be watered pretty heavily after planting. A few inches of mulch can help delay freezing, allowing more time for the roots to take up water. Find out the right depth to plant your tree. Once you have an eye for this, you’ll start noticing that most trees are planted incorrectly, often with too much of the root flare or even the trunk—ACK!—below the soil line. The root flare, which is the section where the base of the tree trunk flares out at the roots system, should be visible above the soil line. This allows water and oxygen to reach those roots. This tree planting guide has some good images showing best and worst practices. How to know if you are planting a tree at the right depth from Michigan State University is helpful as well. Also note, it’s a crime against nature to pile mulch against a tree trunk like a volcano. This can cause all sorts of problems, and, as a tree lover, it’s just plain ugly to look at. Keep the mulch on the ground, away from the base of the tree, where it can help insulate the roots. Best: 50°F / 10°C minimum soil temperature with 6-8 weeks before ground freezes for deciduous trees. More time for evergreens. 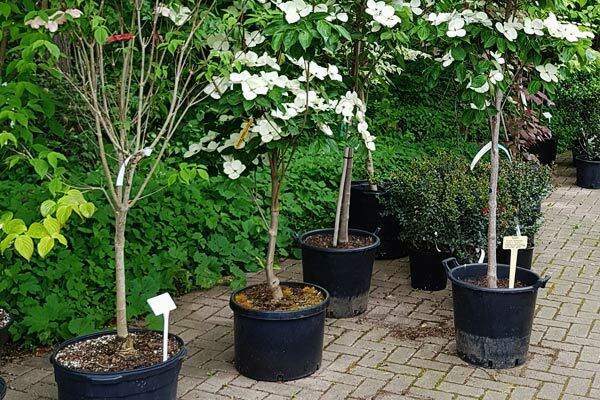 Ask a trusted garden nursery the best season to plant the tree you want, and make sure you can get one! Learn the right planting depth, exposing adequate root flare, and never pile mulch against a tree. Do apply a layer of mulch to insulate the ground surrounding the tree. Continue watering until the ground freezes. Resume watering in spring unless heavy rains are doing it for you. And good luck with your tree! Can hummingbird feeders delay their fall migration? Are Epsom salts necessary for the garden or a myth? Hi Robin, Sounds like it should be fine. Are you going to plant them in spring?